"Cushing's" and "metabolic disease" are terms that veterinarians and horse owners use commonly. But not everyone is familiar with the actual conditions to which these terms refer. Both are endocrine diseases that occur commonly in middle aged to older horses. Endocrine tissues of the body are those that secrete hormones or other chemicals that affect the metabolic processes of the body. Tissues classified as endocrine include the pituitary gland, pancreas, adrenal glands, thyroid gland, and parathyroid glands, among others. In very simplified terms, an endocrine disease is a condition that affects the ability of an endocrine organ to secrete the necessary hormone. The cause of PPID has not been determined, but there are several theories. One suspicion is that the pituitary tumor has no underlying cause but is primary in nature. A second theory suggests that neurodegeneration takes place. In this theory, the neurons that travel between portions of the pituitary gland are degenerating, which ultimately results in decreased levels of dopamine being released into the pituitary gland. This theory is similar to the cause of Parkinson's disease in people, which is also a neurodegenerative process. Symptoms of PPID in horses are due to increased levels of cortisol in the blood. The symptom that is most highly recognized is hirsutism (her-suh-tiz-um), which is a shaggy hair coat that does not shed out normally. The presence of hirsutism will give you a definitive diagnosis of PPID, but the absence of hirsutism does not rule out the possibility of the disease. Other symptoms associated with the hair coat include long wiry hairs and late shedding. Muscle loss is common and will give the horse a pot belled appearance due to decreased abdominal muscle tone. Loss of muscle in the gluteal region and along the spine also occurs commonly. Fat deposits along the tailhead, sheath, and crest of the neck can be seen in both thin and overweight horses. Increased levels of β-endorphins will cause a depressed or lethargic attitude. Increased cortisol in the blood can predispose a horse to infection which can manifest as parasitism (intestinal worms), skin infections, sinusitis (infection of the paranasal sinuses), chronic hoof abscesses, upper respiratory tract infections, or poor wound healing. Occasionally a horse will have increased drinking and urination but this is not a common sign of PPID. Laminitis is a prevalent finding in horses affected with PPID. The cause is unknown, but it is thought that an increased cortisol can cause laminitis or that the insulin resistance that accompanies PPID affects the nutrients required by the laminar tissues of the hoof. Early and accurate diagnosis of equine PPID is essential, because the disease is both common and life threatening if left untreated. However, there is not a simple test that will tell us if a horse is positive or negative for PPID. The diagnostic tests available can be difficult to interpret. Diagnosis of PPID relies on testing the responsiveness of the endocrine tissues of the brain and adrenal glands. Resting ACTH concentrations are performed regularly when PPID is suspected. ACTH is secreted by the adrenal glands in response to cortisol in the circulation. A high resting ACTH indicates PPID. Seasonal variations in cortisol are seen, with higher levels in the fall months than other times of the year. This can cause PPID to be falsely diagnosed in the fall months. There are several other tests that require administration of a substance and subsequent testing to determine the effect of the substance given. The dexamethasone suppression test is the gold standard for PPID diagnosis. The horse in question is given a steroid called dexamethasone. Normally, dexamethasone administration results in decreased serum cortisol concentration. In a PPID affected horse, cortisol concentration will remain elevated instead of decreasing. Seasonal variation in cortisol can also affect the dexamethasone suppression test, so results must be evaluated with seasonal variations in mind. Steroids can cause a worsening of laminitis, therefore a dexamethasone suppression test should not be performed in horses with a history of laminitis. At Purdue University, the domperidone response test was developed and gives reliable results. Domperidone is a substance similar to dopamine, which was mentioned earlier. Therefore, in PPID horses that are not secreting dopamine normally, the administration of domperidone will cause an increase in ACTH. Normal horses will show no change in blood ACTH levels. The diagnosis of PPID is often not very straightforward, therefore it is important for your veterinarian to take into account the horse's history, physical exam findings, and necessary blood work in order to get an accurate diagnosis. Equine Metabolic Syndrome or EMS is a condition in horses that is characterized by obesity or regional fat deposition, insulin resistance, and laminitis. The definition of obesity is an increase in body weight because of excessive fat accumulation within the body. 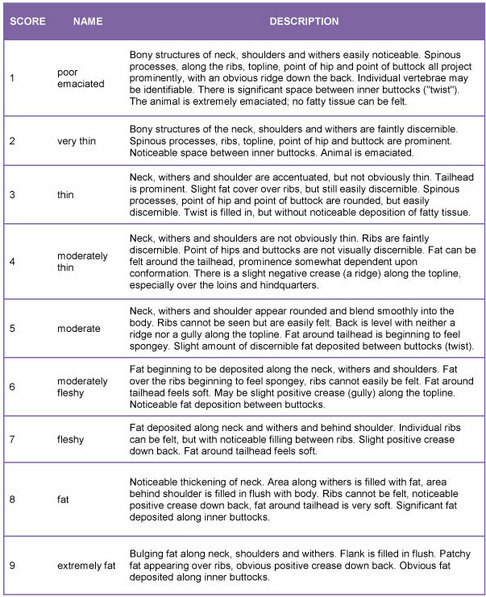 In a body condition scoring system, obesity would be defined as a 7, 8, or 9 on a scale of 1 to 9. An ideal body condition score is 5 out of 9. It is important for horse owners to know the body condition scoring system and be able to score their horses to help maintain a healthy body weight. Regional fat deposition occurs most commonly in the crest of the neck and tailhead, but is also seen in the sheath, above the eyes, and as large lumps along the horse's sides. Laminitis can be either clinical, where the horse shows obvious lameness and coffin bone rotation, or subclinical, where the horse has only subtle signs such as abnormal growth rings ("founder lines") on the hoof wall. Insulin resistance and obesity predispose horses to laminitis, and it must be controlled with weight loss and strict dietary restrictions. The insulin resistance that is associated with EMS is similar to type 2 diabetes in people. However, the high blood glucose that is found in diabetic people does not typically occur in horses and diabetes is extremely rare in horses. The classic EMS horse is described as being an "easy keeper" that does not require much food and remains overweight. Onset of EMS is usually in adult horses over 5 years old. Breeds commonly diagnosed with EMS are those that are predisposed to obesity and insulin resistance, including all pony breeds, Morgans, Paso Finos and Arabians. EMS has been diagnosed in other "easy keeper" type breeds, but is rare in breeds that tend to be leaner, including Thoroughbreds and Standardbreds. The easiest test to perform is resting insulin concentration in the blood. Samples should be taken after horses have been off pasture and grain for 12 hours, as these feeds can cause an elevation in insulin. High resting insulin is sufficient evidence to diagnose EMS. High blood glucose concentration after fasting is also indicative of EMS, but it is not as commonly seen as increased insulin concentration. ACTH concentrations will not be elevated as they are in PPID horses. Glucose and insulin tolerance tests can also be performed on suspected EMS horses. For a glucose tolerance, blood glucose is measured, then glucose is administered intravenously. The horse's blood glucose is continually measured at regular intervals over about 1-2 hours. A normal horse will have a spike in blood sugar soon after the glucose was administered, but it will decrease gradually. A horse with EMS will have a blood glucose that does not decrease as rapidly, which indicates insulin resistance. The insulin challenge is run in a similar manner. Blood glucose is measured and then a dose of insulin is given to the horse. The blood glucose is monitored at regular intervals and in a normal horse it will decrease rapidly after insulin is given and then increase gradually back to normal. Horse with EMS will show some level of insulin resistance and the decrease in blood glucose will not be as rapid. The insulin and glucose tests can also be run simultaneously. How are EMS and PPID different when they sound so similar? Both diseases have similar characteristics, but as described earlier, they have different causes. Certain traits are not consistent between the two diseases. For instance, insulin resistance is a primary component of EMS, but is not always present in PPID horses. ACTH is elevated in horses with PPID, but not in EMS. PPID and EMS affected horses can have a similar appearance, but the status of the endocrine organs in each horse can be different. They also require similar management practices, but PPID has a specific drug treatment, whereas there is not a specific drug used to treat EMS. Disease Trait Present in PPID? Present in EMS? Is there a drug we can give to cure PPID or EMS? Treatment of both PPID and EMS will require strict management changes. Management factors will depend on symptoms of a specific horse. Some horses with PPID have difficulty cooling themselves in the summer and body clipping can make them more comfortable. Horses suffering from hirsutism often resume a more normal hair coat after pergolide therapy. Hoof care is extremely important in horses with PPID and EMS. PPID horses are prone to hoof abscesses and laminitis, so owners must be vigilant in monitoring for lameness. Increased risk of infection can also lead to dental problems, such as tooth abscesses and subsequent sinus infection. Regular oral exams and dental maintenance are necessary in PPID horses. Management of laminitis includes corrective trimming and shoeing, radiographs to know the extent of damage to the inner structures of the hoof, and a very strict diet to prevent exacerbation of insulin resistance and promote weight loss. A strict diet is required because insulin resistance is a main trait of EMS and horses with PPID can also be affected. Body fat must be decreased in obese animals to improve insulin sensitivity. It has been proven that horses with fat deposits over their neck, tailhead, sheath, and other areas are more likely to be insulin resistant. Feeds that exacerbate insulin resistance must be eliminated from the diet. Exercise and weight loss are very important in horses with insulin resistance in order to decrease body fat and increase insulin sensitivity. Changes in diet should be done slowly (over about a week) to prevent sudden changes in the gastrointestinal tract that might trigger laminitis. 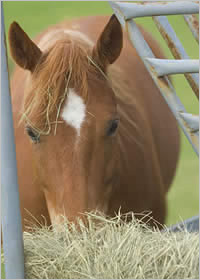 The majority of any horse's diet should be forage, including grass and hay. A mature horse should eat 1.5-2% of their body weight and at least half of this amount should be roughage. This means that an average 1000 pound horse should consume about 15-20 pounds of hay a day, which equals approximately 5-7 flakes. Owners should weigh their flakes in order to feed horses an accurate amount each day. Soaking hay in water for 1-2 hours before feeding is a good way to rid it of excess starches. Obese horses should not be fed any grain. If you have a horse with endocrine disease that exhibits weight loss, low carbohydrate feeds are recommended to provide additional calories without increasing the amount of sugar in the horse's diet. There are many feeds specifically formulated for this condition which include: Well Solve L/S by Purina, Banks Mill Low Starch, ADM Stay-Strong, Nutrena Safe Choice, and others. Beet pulp is another feed stuff that can be fed to thin horses; however it must be soaked thoroughly before it can be fed. Rice bran and oil are fat supplements that can be added to your thin horse's feed as well. This will add more calories without adding sugar. Other feeding tips include offering smaller meals 3 to 4 times a day to allow for a more normal insulin response and feeding hay 30 to 45 minutes before offering grain. Sugary treats should also be avoided. In the overweight horse, supplementing the diet with Thyro-L has been proven to promote weight loss and increase insulin sensitivity. Thyro-L is a synthetic thyroid hormone supplement that is given daily on the feed. It is a prescription medication that should be used only under the guidance of a veterinarian. Below are a few diet outlines that can be used to feed a horse with endocrine disease, based on the horse's body condition. 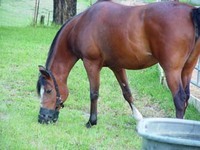 Pasture is the most sugar-rich feed in a horse's diet, and should therefore be a limited part of the diet. Pasture should be avoided during times when the starch content is the highest. These periods are usually during spring when it is growing, in the early morning hours when sugar content is highest, when there is rapid growth after a heavy rain, and when the grass is entering winter dormancy. Pasture access should be restricted or eliminated in horses with insulin resistance. Sometimes this is only necessary until the desired weight loss is achieved. In other horses, especially those that suffer from recurrent bouts of laminitis, pasture access will need to be limited for a lifetime. Horses with PPID or EMS that have recurrent bouts of laminitis should only be allowed on a dry dirt or sand lot. The best ways to manage an insulin resistant horse on pasture is to limit grazing time to 1-2 hours per day, strip graze in small areas, or apply a grazing muzzle. Exercise is also essential to a horse with PPID or EMS, because weight loss is a very important part of the treatment regimen. As long as the affected horse is not suffering from laminitis or another cause of lameness, they should receive moderate exercise on a daily basis. Moderate exercise would be classified as 1 to 2 hours of walk/trot/canter work. Endocrine diseases have a significant impact on the horse population and will continue to for years to come. Proper diagnosis and management is required to allow affected horses to live a long and healthy life. If you are concerned about your horse's health, please contact us at Conley and Koontz Equine Hospital 877-499-9909.